If you’re trying to add a little something extra to your website, case studies may be just the new creative piece you’re looking for! So, what exactly are case studies? Simply put, they’re an awesome way to tell a customer story and go a step further by showing your client instead of just telling them. By taking a deeper dive on one specific case, you’re painting a clearer picture of your services and allowing clients and prospects a more in-depth look at what they can expect. The best case studies are going to be ones that many clients can relate to, such as planning for retirement, paying for college and many others. This way, they’ll start to picture themselves in that situation and achieving the happy ending, like your case study will likely show. Twenty Over Ten client, Retirement Matters Illinois, uses case studies on their website to highlight situations they’ve worked on. Because we’re unable to use testimonials in the financial services industry case studies are a great alternative. Case studies are a way of marketing that give potential clients a detailed start to finish look at how they can benefit from your business. When people know what to expect, they’ll be much more willing to jump right into working with you- which is exactly what you want. Case studies are also a great way to clear up questions for people who may be seeking financial help for the first time. If they are hesitant about it, they’ll have a great example to push them in the right direction. Additionally, if you’re looking to target to a very specific group of customers, you can use your case study to go into detail about how you can solve their particular problems. When done right, case studies can easily help you build credibility with potential clients and be a great addition to your website. This adds another question- how should you incorporate case studies on your website? If you’re unfamiliar with them, don’t worry! 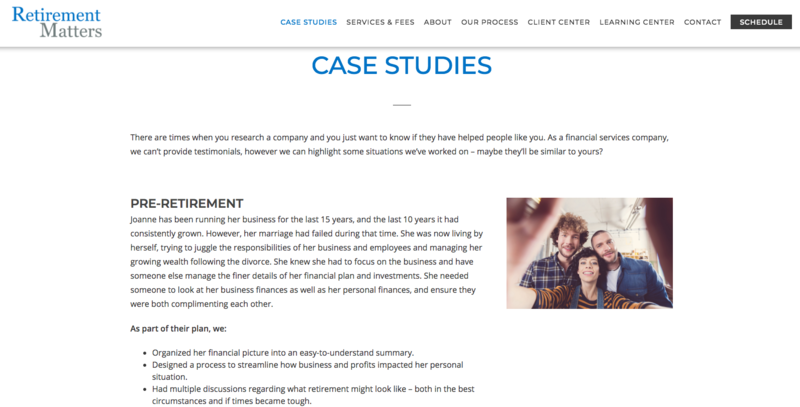 Today we’ve compiled some best practices for including case studies on your advisor website. First things first, you should make a page on your website dedicated solely to your case studies. This makes them easy to find and helps them stand out, as opposed to burying them in other tabs. Ideally, you want potential clients to be drawn to them and encourage them to read the studies when they visit your website, so displaying them prominently is key. This will also show how unique your site and firm are, since case studies aren’t as typical as many other pages. 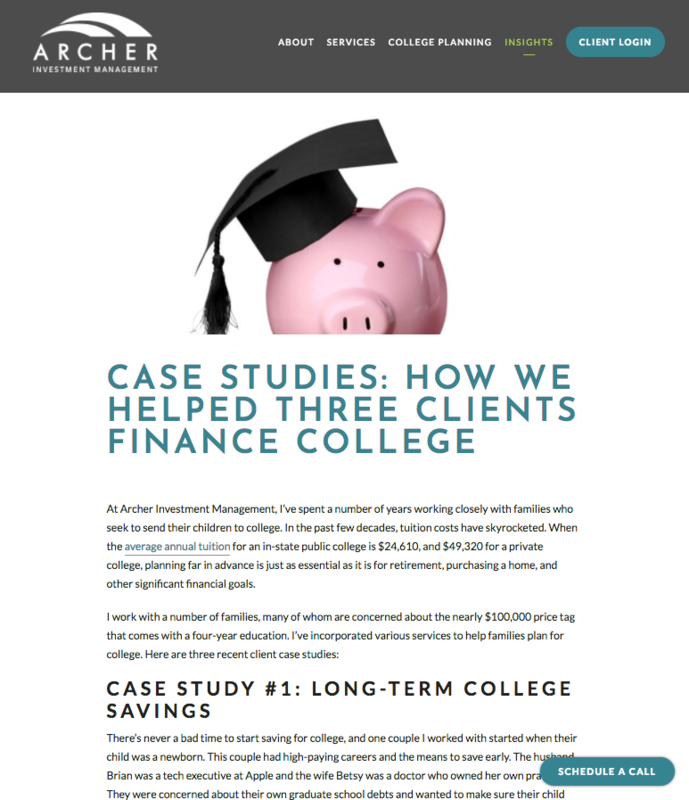 Twenty Over Ten client, Archer Investment Management, chooses to share their case studies in the “Insights” section of their website. While you can simply call your page “Case Studies,” you should also feel free to get a little more creative! Based on your brand and firm’s personality, you could try to play around with the wording so clients know they’ll be reading something useful and relevant. A unique name will make them even more intrigued and ready to read your studies. We’re sure you’ve already got a great blog up and running, so featuring your case studies would make an awesome post! Not only will it draw attention to them, it gives you a chance to explain to clients and prospects what exactly they are and why they should be paying attention to them. Consider giving your blog visitors an overview of the topics your case studies cover and how they can benefit from reading them. This will also give you even more of an opportunity to showcase your expertise. The studies can only do their job if people know they are there and are excited about them, so don’t hesitate to share all you want! Our case study with eMoney was featured on our blog. A blog post about your case studies is also great to share in newsletters and across your social media channels. The more places a client or prospects sees and hears about them, the more likely they are to check them out! At the end of the day, the entire purpose of your marketing is to get clients to take action. Your case studies are no exception. The studies should encourage clients and prospects to take the next step after reading them, whether that be scheduling an appointment, calling you, or visiting your website. While it shouldn’t come across as too sale-y or pushy, there are certainly ways to encourage persuade them without being too aggressive. With each step of the case study, you can subtly give the reader a way to make a similar step with your firm. Not only is this great for you, but it is helpful for the reader who is probably looking to take action if they’re taking the time to read your study. 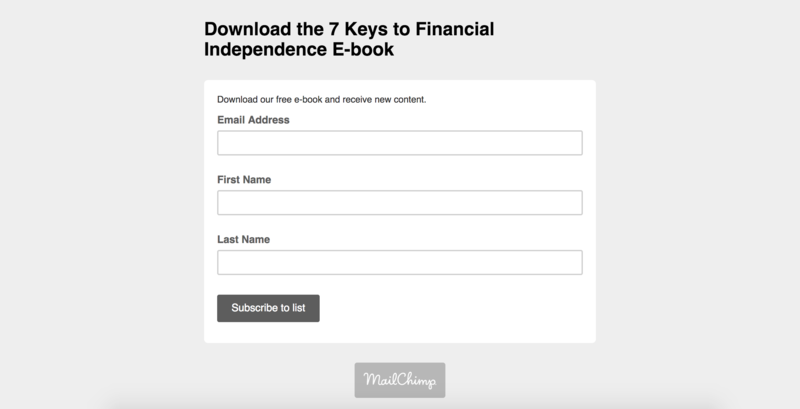 Twenty Over Ten client, Financial Planning Done Right, implements a form to fill out before you download a freemium. Another unique way to accomplish this is to create a sign-up form asking for name and email address before they can access a copy of your case study. This way, you can be sure you’re getting some qualified leads from everyone interested in reading your studies. However, this is a personal preference and depends on how you want to make them available. 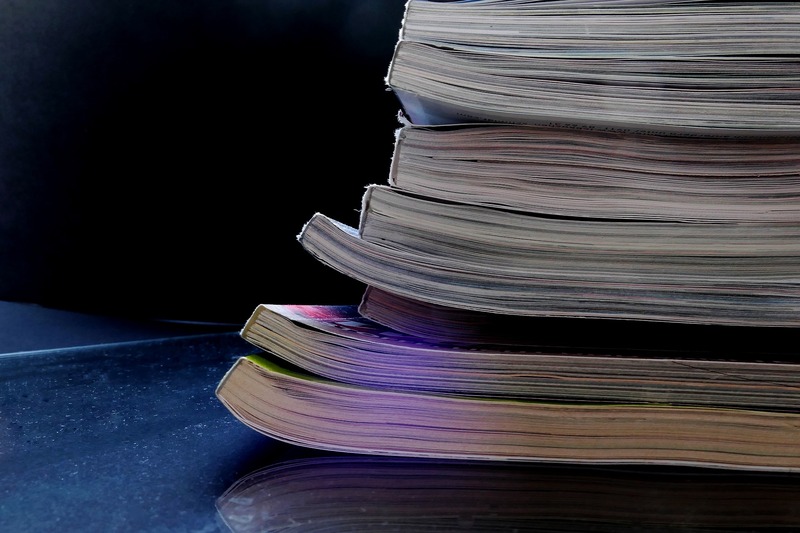 Publicity is going to be your best friend when it comes to successful case studies. This means sharing them on your social media channels and including them in newsletters your firm may distribute. This is how both existing and potential clients will find out about your case studies and how you get the news shared by any partners or affiliates. 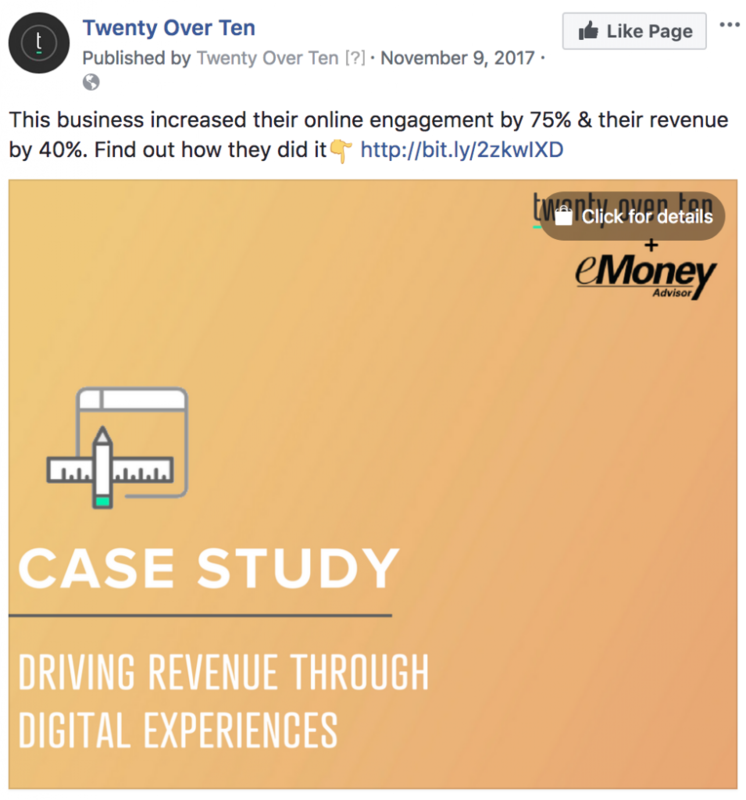 Twenty Over Ten uses Facebook to publicize the publication of our most recent case study with eMoney Advisor. Make sure to include a general topic and any surprising or impressive details or facts that will make your audience want to read more. Social media is a great way to engage and create buzz, so don’t miss out on the opportunity to do this for your case study! By implementing the right steps, case studies can help your lead generation skyrocket. By knowing your market, enticing readers and making sure you share it, your prospects will be ready to take action in no time.